Has the fog of debate around climate change, carbon trading and reporting blinded you to the full story of business and the environment? Are you doing business in out-of-date assumptions about business and the environment? Are you still living in the mindset that “environment = cost”? Are you sure that all you’re accountable for is compliance inside your four walls? Will carbon trading and some fancy reporting really be all you need to keep doing good business? Is that all that sustainability is about in your industry? Or is a quiet part of you wondering about those issues that started appearing in the 1970s and haven’t gone away yet? Maybe, just maybe, you sense that there’s something you’re missing? Is regenerative thinking starting to drive strategy in your industry? In the early 1990s smart thinkers proposed new mindsets for doing business differently – and smart entrepreneurs listened. As entrepreneurs do, they did more than just listen – they acted. In small businesses and large businesses both internationally and locally some fascinating new realities have emerged. 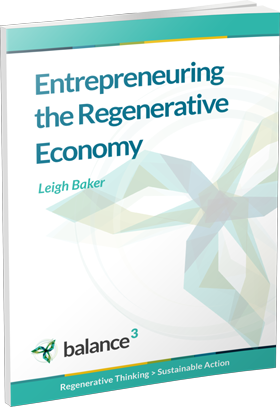 Experiments and explorations over the last two decades have produced exciting and unexpected results – strategic, whole-of-business, supply-chain oriented regenerative business can be highly profitable. Not in some possible future, but real world, here-and-now business opportunities. When you put aside your assumptions and start really looking, you’ll notice that they’re happening around you, here, today. 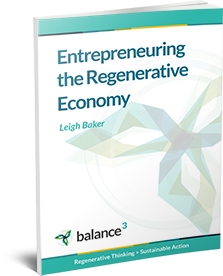 Who’s doing regenerative business in your market? Do you know? Are you even looking? This is your opportunity to find out whether you’re missing the real action of the sustainability game. It’s a 2-hour, plain language, big picture executive briefing about business developments of the past decade that rarely make it into the mainstream media. So you can make an informed leadership decision for your business.